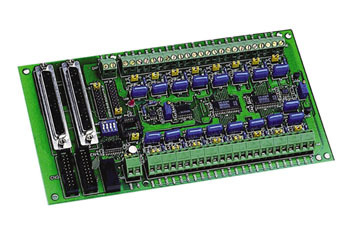 The OME-DB-889D is an expansion multiplexer/amplifier board for use with OME-PCI-1800 series families. Each OME-DB-889D multiplexes 16 differential analog input channels into one analog input of the DAS board. The high grade instrumentation amplifier provides software programmable gains of 0.5 , 1, 5, 10, 50, 100, 500 and 1000. Thermocouple measurements are handled easily with the OME-DB-889D. The board includes cold-junction sensing and compensation circuitry that provides a scaling of 24.4 mV/°C. Biasing resistors are included for open thermocouple detection. The OME-DB-889D can be cascaded to a total of 128 channels of voltage measurements or 112 channels of thermocouple measurement. The OME-DB-889D has two 37-pin D-sub connectors and two 20-pin headers. One D-sub connector gets connected to the A/D board’s analog input connector while the other D-sub connector can be used to cascade to another OME-DB-889D multiplexer. The 20-pin header is the multiplexer’s control logic circuit. One of the 20-pin headers is connected to the A/D board's digital output port via 20-pin flat cable. The other 20-pin header is used to cascade to another OME-DB-889D multiplexer. 참고: Each OM-DB-889D board includes complete operator ’s manual on CD ROM.